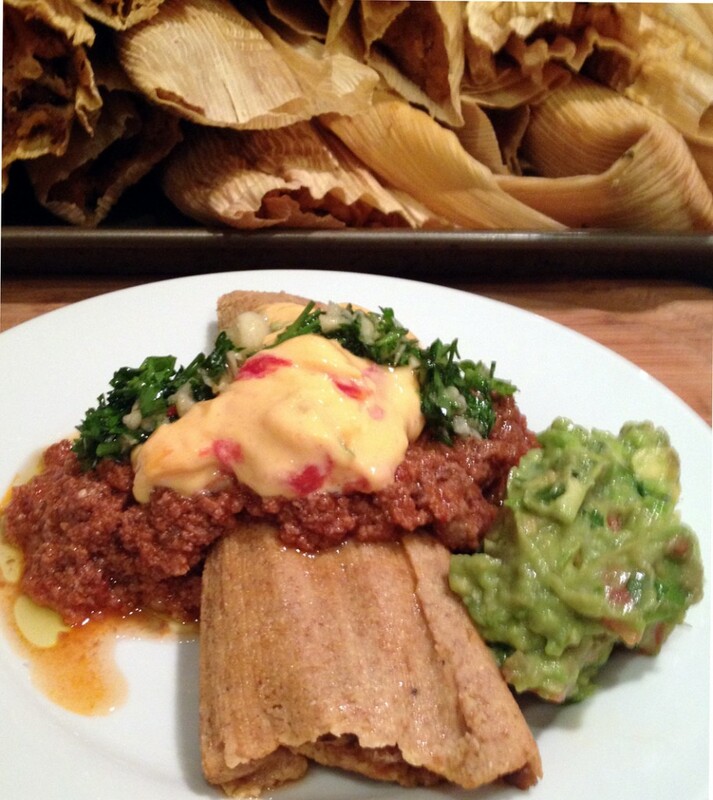 Here is the full recipe for using our extraordinary Tamale Mix! Combine mix with 1/4 cup lard or other fat along with 2 eggs. When combined add 4-6 cups of broth until the dough is the texture of smooth peanut butter. Wrap them up as usual and steam for one hour. Let sit then serve! If you are a first timer to making tamales and need the whole process, here it is! Sear sides of the pork roast in a large skillet, then place roast in a crock pot. In the same skillet add fat and melt over medium-high heat. When melted add onion, garlic, cumin seeds, jalapeno and chiles. Cook until seared. Add chipotle peppers and adobo sauce to mixture and continue cooking until combined and heated through. Transfer seared mixture to crock pot over the roast. Add salt and water, then cook roast on low for 8 – 10 hours. Turn crock pot off and let cool for a few hours. Drain liquid and shred meat with a fork, retaining the liquid for masa. In a mixer bowl combine Tamale mix with lard and eggs until it is a smooth dough. Add liquid from the meat one cup at a time until it is the consistency of smooth peanut butter—you will need anywhere from four to six cups of liquid. To build the tamales pat dry one corn husk, then lay it flat on your work surface. If you don’t want to use corn husks you can use parchment paper, cut into 6” x 9” rectangles. Spread “masa” evenly in the middle of the husk, leaving 1 – 2 inches clear at the top and bottom, and along one side. Drop a row of pork along the middle of the “masa”, to the very edges of where it is spread. Gently roll the tamale, making sure the “masa” completely envelopes the pork in the middle. Overlap the sides of the husk and fold the small end up. A small strip of husk can be used to tie around the tamale to keep it closed, or just lay completed tamales face down on seam side to avoid unrolling. Repeat process until you run out of supplies. In a deep stock pot with pasta/steamer insert, fill bottom of pot with water, but no higher than the bottom of the steamer insert—tamales should not be sitting in water at all. Fill the insert with tamales by lining them up vertically, with folded end down. Place cover on pot and heat to boiling, then turn heat down to simmer, making sure steam continues to rise. Steam tamales for about one hour, until the “masa” is firm and they are heated through. Remove tamales from pan and lay out in a single layer, allowing them to dry out a bit. When ready to eat, unroll the tamales from the husk and eat plain or smother with your toppings of choice.